We have some fun news to share: Mr. Frugalwoods and I were on The Today Show on NBC this morning! Here’s the link to watch the segment online if you’re interested. Mr. FW and I were shocked and honored that they reached out to us for an interview and, we had a fabulous time filming right here in our home. 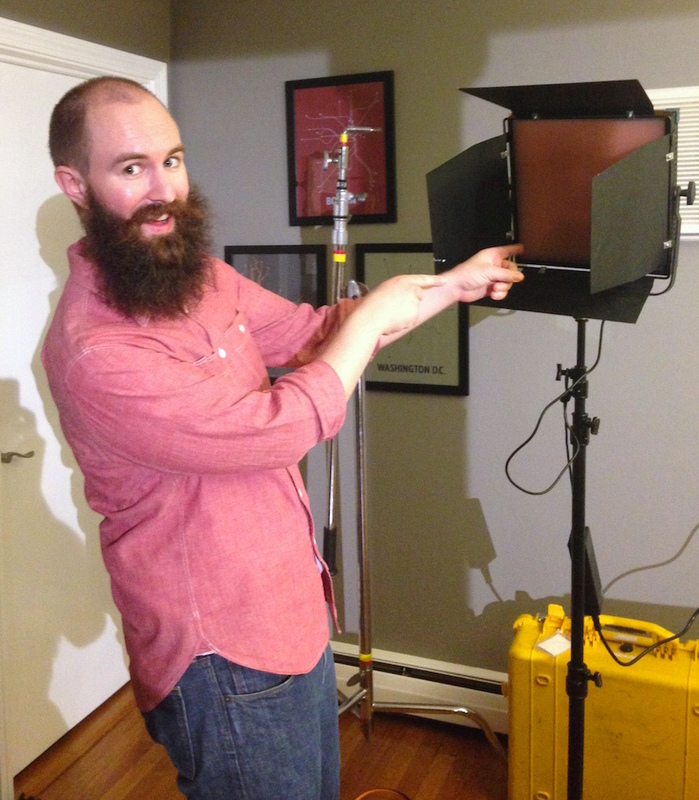 The very friendly crew brought in cameras, lights, microphones, and all sorts of fancy television paraphernalia. 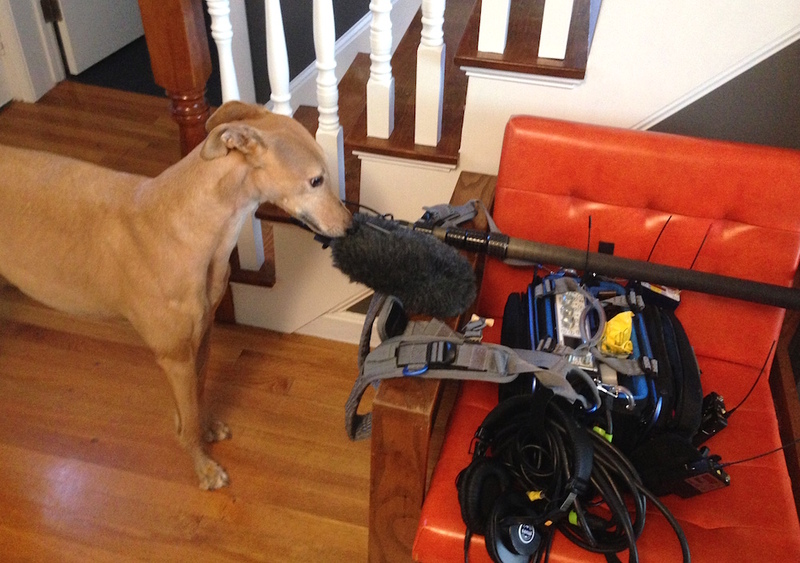 Our little home was transformed into a TV studio, which was a pretty cool experience (although Frugal Hound wasn’t too sure about the whole thing). Frugality isn’t something that’s typically discussed in the mainstream media as a joyful life choice. 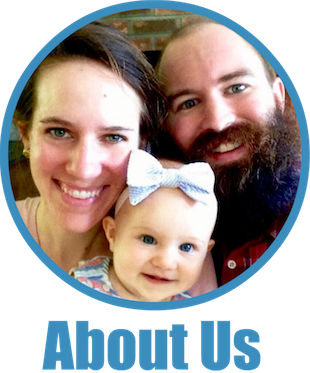 It was a privilege to share our thoughts on how extreme frugality makes our lives more peaceful, happier, strengthens our marriage, and enables us to pursue our passions. Finding contentment with what we already own, disavowing our culture’s call to consume, following a path that fulfills us, and looking for meaning in life beyond the exchange of money is what we’re all about. We live a life of frugal luxury that’s not deprived or miserly–rather, we spend only in service of our larger goals and on things that bring us happiness. TV equipment in our house! We’re thrilled that you all have chosen to join us on our journey to financial independence and a homestead in the woods of Vermont. It’s a pleasure to share our story with you and I deeply appreciate all of your emails, comments, Facebook messages, tweets, and Instagram posts. Hearing about each of your personal explorations towards more meaningful, purpose-driven lives is what motivates me to keep writing. Thank you for reading, for sharing, and for encouraging us! And now, you’re probably wondering if we did this interview with bags over our heads… rest assured, although we’re frugal weirdos, we didn’t do that. Thus, the time has come to divulge our real faces and real names. It has been interesting, and sometimes challenging, to write anonymously for the past year and a half, but I’m excited to now write to you with my actual face :)! Not much will change here on Frugalwoods because I’ve always written with the philosophy of transparency and never making stuff up. You all know more about our lives than many of our close friends and family members, so seeing our faces is just kind of superfluous for you at this point, right ;)?! 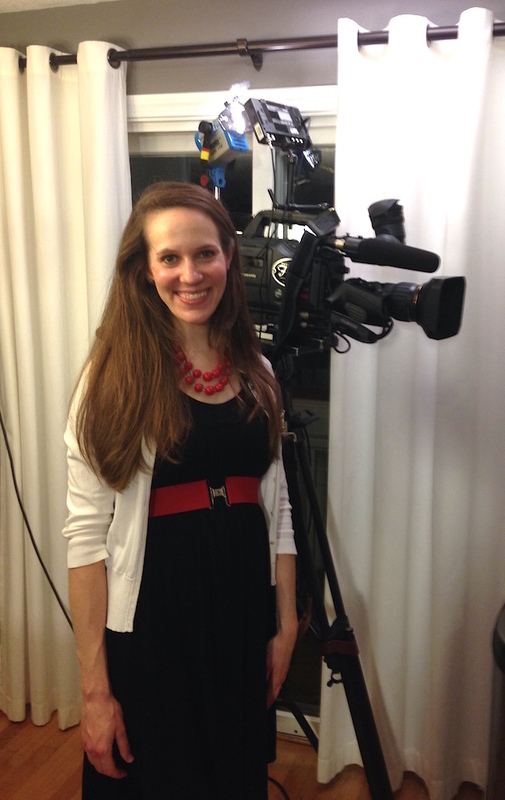 Me at 6.5 month pregnant + a TV camera! Have a wonderfully, joyfully frugal day! I look forward to continuing on this journey with you. :D. Looking forward to the Today segment and sharing with the class! Congratulations on being on TV! Will look forward to watching when you post the link. Nice seeing pics of you. Best wishes as you continue towards your goals. I can’t wait to watch the segment! 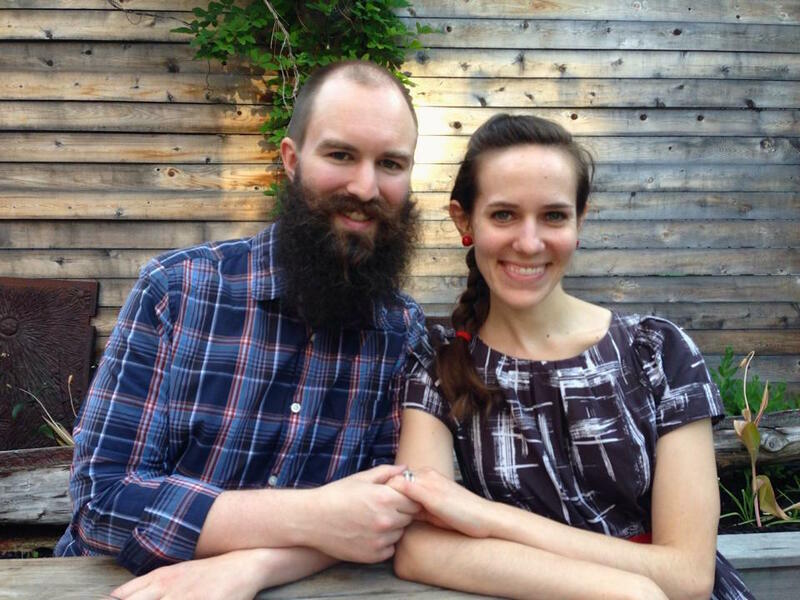 You guys are a beautiful couple and your baby and Frugal hound’s names are divine! So nice to see you! You two look so nice , I love to see your eyes. Congrats for your TV show ! I am pleasantly surprised that televisions are interested in showing nice, normal, intelligent people, not just big stars and commercials. Wish you the best! Hi Liz! Hi Nate! Hi Estelle! Hi Gracie! Very much looking forward to watching this segment. Hooray! Never in a million years would I have guessed Gracie’s name. Estelle is lovely. Cheers to you all! Hi Liz, Nate, Estelle and Gracie! So wonderful to “meet” you at last! Can’t wait until we can do the same. Curious how it feels to you guys knowing that your employers could find out — or are you “out” at work? Either way, love seeing your names and faces, and congrats on the Today feature! We’re definitely “out” now :). We knew it would happen at some point, so it’s all good. Very nice to “meet” you – lovely names 🙂 congratulations on being on tv, that’s very exciting 🙂 hope you’re enjoying parenthood; those few newborn days are both amazing and stressful in equal measure! What in the world?!? I was watching the Today show as I do everyday and I see my Frugalwoods …with Faces! Great to see you. How exciting it must be to reveal yourselves to everyone and in such a great way! Congratulations on the interview! I’ve reading your blog for awhile and working with my husband to embrace a more frugal lifestyle. Had to share the fortune cookie fortune we received last night: “You shouldn’t overspend at the moment. Frugality is important.” Seems fitting as we begin this journey! Thanks! That’s a pretty astute fortune cookie! I just signed up yesterday thinking “what a fantastic site”, but I was sad that I’d never get to put faces to the names. My wait was 1 day. Ha! Haha, glad you found us and are joining along in the adventure :)! I was always afraid I’d slip and call you Liz. I’d read and reread everything I wrote here just to make sure I didn’t. Now I can claim you publicly, too. I am the lucky godmother of this delightful, charming, intelligent young woman! Nice to meet you!! Love the name Estelle! Cool! Looking forward to the segment. Wow, another monumental day for your family! You just may be starting a revolution with the Today Show! Woot! Liz and Nick nice to meet you; I always had you figured as a Lauren and Steven in my head for some reason – and Greta the dog LOL. Pretty amazing to schedule in a TV showing after giving birth – super woman! Estelle is a beautiful name. Very nice to see your lovely faces finally now! How exciting! I can’t wait to watch the segment. And I hope there aren’t any negative percussion a for either of you with your employers. No more incognito! lol I love your blog. Congratulations on your little girl, too! Ack! This is AWESOME! I am so pumped for you guys! Congratulations on everything…your frugality, your steadfast dreams, and your baby! Do I see a book deal coming…ha, ha, but not really. You both are great writers and your light no longer hides under a bushel. Lots of people will see and hear your “message” that frugality can be fun and so incredibly rewarding. Here’s to a wonderful new year ahead loaded with all sorts of new adventures and possibilities! sniff, sniff… tearing up…. isnt this cute! congrats on the today segment, Liz (Nate, Estelle and Gracie)! quick query…. does Gracie respond to Frugalhound? does she respond to Frugalhound is a treat isn’t in the offering? Hello Liz and Nate! Estelle is such a pretty name!!! And thank you for finally answering the question I felt too silly to ask, do you actually call that sweet dog Frugalhound? Gracie is quite fitting! Hope you are enjoying your new chapter in life!! Thank you! Took us awhile to select Estelle, but we’re pretty happy with it :). That would be pretty hilarious if Gracie’s real name was Frugal Hound–hah! It is truly nice to “meet” the two of you! Congratulations on the interview. Stuff is really getting exciting now. 🙂 I’m happy you have decided to share your story with the world. You’re an inspiration to myself, and many, many others. Keep up the great job! I saw you on the today show. Really enjoyed it. Congratulations! I’ve been reading your blog for 8 months. It is nice to see you!!! Looking forward to the Today Show segment. Hope Babywoods (Estelle!!!!) is doing well. In this holiday season being frugal has been a challenge with adult children (and their children – my grandchildren) who are accustomed to something other than “frugal.” I’m going middle of the road this year and will be more frugal next year. Love and sweet dreams to Frugalhound….a sweet name for a sweet, nap-centric pooch. Just watched the segment – you two are adorable! Keep up the great work and blazing the trail for frugal living. Congrats on the new baby and your frugal success! 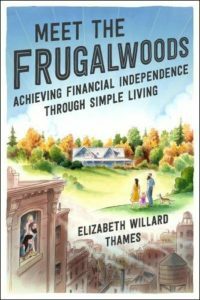 Been reading a while and you inspire me to keep on with my own frugal WIERDO lifestyle 🙂 Hoping to be mortgage free (my final debt) in 2 years or less, so I can retire before 60 – I just turned 50 so it’s not going to be an easy task! That’s awesome, Cheryl! Good luck to you and I’m so glad you’re proudly waving the frugal weirdo flag :)!! Hi Liz and Nate! Congrats on the feature! You’re so famous! Hello Liz, Nate, Estelle, and Gracie! Free Santa and crafts?! I’ll meet you there. So nice to meet you all! I love all your names — but especially Estelle and Gracie! Yay for the unveiling of the lovely Frugalwoods family!!! Nice to meet you both and Gracie! Congrats on baby Estelle!! Congratulations on the Today Show and showing us your faces! How incredibly exciting! Can’t wait to see the show! You are so photogenic. I mean it too! I love Gracie. Can’t wait to see the Today show segment. Hi Estelle! You guys are so cute! And I love the baby’s name! You are such an inspiration and it’s wonderful that The Today Show shared your story with a wider audience. Congrats! Hahaha, that’s ok, you can still call us the FWs :)–it’s weird for me too! Congrats to you two! This is so exciting. Looking forward to watching all the frugaly goodness. Congratulations – What a great opportunity for you to spread your lifestyle philosophy! Think how many you will reach and inspire ! Whoop! Nice job on the interview. Now the only problem with my life plan of writing a blog and getting on the Today Show is my small apartment. Ain’t no TV cameras getting in here. Thanks! 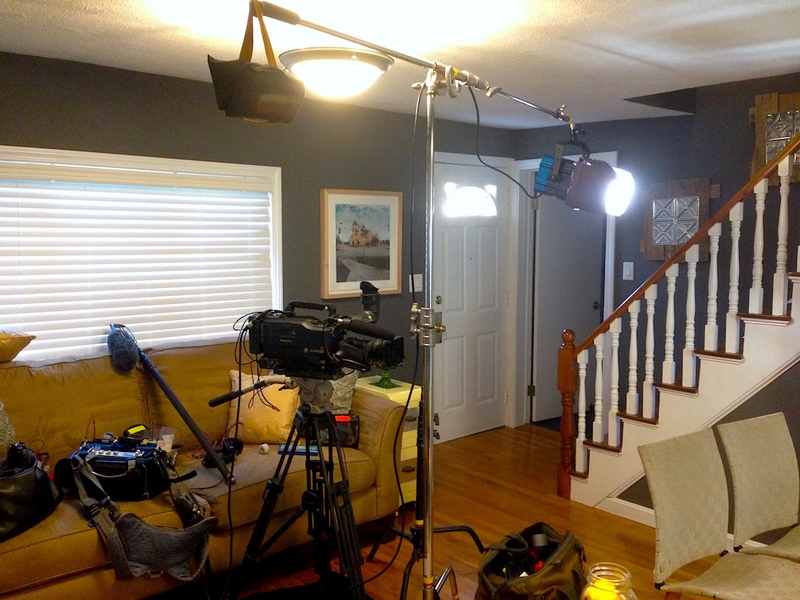 And, you’d be surprised how much TV equipment they can squeeze into a small space–the main floor of our house isn’t very big at all! You guys were great this morning on the Today Show. I turned it on right when they were introducing your segment. I wish they would have mentioned your blog and went into more detail about what you’ve done over time. But I’m glad I was already informed. They should make you guys a segment! You’re so sweet–thank you :)! Congrats! I watched and it was great! Whoo hooo! Major congrats! I know you were worried about how you would be portrayed but honestly it makes me admire you guys even more, and I’m trying to follow in your footsteps as best I can (expect the hair part, of course) with my new full time job. It would be easy to spend with some new income, but I just want to save! Thank you my friend! I was relieved that we didn’t look like total morons ;). And, I hear ya on the hair–we all have our thing. Great segment, I love it! It’s nice to see who you two are now 🙂 I had a chuckle at Mr Frugalwoods beard, quite intense. So funny that he thinks of it as a face warmer, LOL! Many congratulations on the interview and finding a camera that doesn’t cut off your lovely faces. So very happy for you fantastic, frugal weirdos. Congrats! Hi Liz, Nate and Gracie! 🙂 I’ve specifically stayed quiet and anonymous because I like it that way! It must have been fun to be on the Today Show though! Loved the segment. You guys are great! Estelle is a perfect name. I love your blog and adore the podcasts you have been featured on, I just told my hubs I can’t wait until you retire and we can all ‘meet’ you, what a delightful surprise! congrats on the segment and more importantly on Estelle! Nice to meet you, too, Nate, Liz, Estelle, and Gracie! And congratulations on your TV segment. Can’t wait to see it. And by the way, love your baby’s name…Estelle. The part at the end where the newscasters are talking about how they wouldn’t want to be all the way frugal reminded me of Afford Anything. The woman says, “I like eating out!” Well, you can afford to eat out. And you can afford to retire early. Just maybe not both. Because you can afford _anything_, but you can’t afford _everything_. Yes! Good point! I’m a big fan of Afford Anything and her philosophy is just so perfectly spot on. Congrats on being famous! It’s so nice to see positive and inspiring stories in the news. How fun to finally “meet” you, and congratulations on the TV segment! Thank you for sharing your story on National TV–the world needs to hear your message! You give hope to others in so many areas of life! PS You’ll always be the Frugalwoods to your followers! Thank you so much! It was an honor to share our mission on such a large platform :). And, you can always call us the Frugalwoods :)! Congrats to you both & fambam! You guys are awesome! I was shocked when I learned Frugahound’s name is Gracie (shoot! same as mine),lol! Congrats! I happenned to be watching the Today show and they announced a couple that plans to retire early in a later segment w/o any details. When I saw a pic of that distinctive BEARD and your long hair, I yelled out to my wife “they are the frugalawoods”! Nice segment! Beautiful names, beautiful family. Congratulations on the interview! Well, pleased to meet you, finally! Cute faces and cute names, especially Estelle, very pretty and unusual. Congrats on the show, off to watch it. Oooo I like Bella as a hound name! I’ll have to file that away for future reference. Hi Liz, Nate, Estelle & Gracie! I feel blessed for finding your blog a few months after you started writing! The two of you an inspiration for anyone that chooses to follow the less beaten path or create their own. Congratulations for being on TV, I hope more people will follow your example and someday retiring early, saving aggressively, working with a purpose, and sculpting your dream life will be the norm, not just the lifestyle of frugal weirdos. Thank you so much! I really do hope we can give folks the idea that there’s another path out there in life beyond the consumer-focused norm. Thank you for the encouragement! So great to finally “see” you! You chose such a beautiful name for your baby girl! Thanks for sharing so much…you are truly an inspiration! What an amazing opportunity. I hope your blog keeps it flavor and that you don’t get haters out of the wood works. Also I have to say I love baby Frugalwoods name. Estelle! So fun to see this! I have enjoyed your blog for a few months now. At the non-profit where I work, we hold monthly “virtual” in-services where we all read the same article online and answer a few questions about it. Those who complete the activity put their names in a monthly drawing for a Walmart gift card. I was assigned the topic of financial empowerment for December and used your post on strategic luxury. The feedback so far has been very positive – they picked up some good ideas and enjoyed something different than the usual (boring) finance articles. There might have been a few jokes about the whole staff retiring early, though ;-). 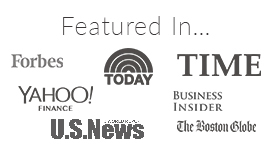 I just sent a link to the Today show segment to our staff as a fun follow-up! That’s awesome! And, I’m super flattered–thank you! btw, I love that the reward is a Walmart gift card–what a useful and frugal thing :). Aww, hooray for the big reveal! Great to finally see your faces. And the Today Show segment was great! You made a very compelling and accessible case for the feasibility of early retirement. Nicely done! So nice to “meet” you! Great segment! Even more inspired now that I can put a face to the name or a name to the face? 😉 Congratulations! It’s like an early frugal Christmas present to see your faces! Congrats on the segment! I’m so proud of you two and I only know you thru your blog! That’s so sweet of you to say–thank you :)! What a pleasure to officially meet you! Outstanding!!!. What I love the most is that you take away the excuse that radical savings CAN’T BE DONE….cuz you are doing it, living it, benefiting from it, and making it rock! I love that you have drawn such positive attention to yourself and know that this will open up a lot of good dialogues about priorities in life and spending. Hugs to the three of you and especially to the Frugal Hound. Warmest regards and Happiest Holidays to you! Many thanks! I do hope we can continue to spread the message that frugality isn’t just possible, it’s also awesome :). thank you for the encouragement! You are such a lovely couple! So nice to know your names now. Estelle is such an elegant and lovely name for your little lady. I’m so looking forward to seeing your tv debut!!!! You are very inspiring. It’s so great to know that there are like-minded people on this frugal and happy journey. Your blog….. and your values…. are wonderful. You all look just like I thought you would:). I am a faithful reader of your awesome blog. I really enjoy your writing style and also your solid stance on frugality being a viable way to life a lux life. Congratulations on Babywoods arrival! Haha–glad we didn’t disappoint in the appearance category ;). Thank you so much for reading and for your good wishes! Congrats on all the success! Really enjoyed the interview today. So lovely to finally see your beautiful faces and learn your names! Awesome – keep up the good work of spreading the word of responsible resource stewardship. I knew you’d both be awesome “real” people, and my theory was confirmed after watching that segment. I think they did a good job capturing your frugal fabulousness. Plus I squealed out loud when I saw Frugalhound!!! Congrats! I was watching the news this morning and saw the promo for the upcoming segment and thought I think I recognize that beard 🙂 You guys did great and it was nice to see your faces too! Very cool and congrats on the success. Finally we don’t see cupcake faces anymore. what a lovely surprise to see you! baby Estelle is going to be quite a beauty–such good genes. loved the Today show piece–you make goal-setting, frugality, and eating-in look doable, interesting, and healthy–not weirdo at all. kudos to gracie on the high-5….. hope she got a long nap afterwards. merry christmas, beautiful frugal family! What a great segment on the Today Show! I was impressed with what one of the journalists said afterwards. Something to the effect of, “I don’t think I could do what they’re doing, but if I could go half way . . . ” You’re getting people thinking – challenging them to make a paradigm shift – encouraging a movement towards the tipping point – so that waste and debt become a thing of the past. Great to too you both, Liz and Nate. Estelle is a lovely name – as is Gracie. All the best! Enjoyed the piece on the Today show – Craig Melvin is from Columbia, SC, where I live, and he is a very well loved native son here! And also love the name Estelle – my great niece, who is 7, is named Estella. Congrats on parenthood and being tv stars! So great to finally see your shining faces! You are an inspiration! Congrats on your success, you deserve it! I have enjoyed watching your journey the last year or two and can’t wait to see the posts about when you find your homestead and start the move and improvement process. Frugal hound isn’t her real name….I’m not sure I can take it in!???? You can still call her Frugal Hound :)! Congrats! I have been a reader for years and it’s lovely to see your faces. Thank you for sharing! Great spot guys! Keep spreading the word! This actually made me tear up! I’m a faithful reader who doesn’t often comment but it is so sweet to know that you are living your dream and making an impact in this way. Well, how fun little Frugalwoodsies! I love the Today show! Do you have an air date so that I don’t miss it? The segment has already aired, but you can watch it online via the link in the post :). Wow! Congrats on being on the Today show and it’s so great to “meet” you! Gracie is such a perfect name for Frugal Hound. I LOVE that you’re finally out of the closet and I don’t have to worry about dropping Liz or Nate. It was a great piece on Today and I hope that you two inspire a bunch of people to make changes in their lives. I watched the Today show clip and you two did a great job! You came across as normal rationale people ;). I was worried the editors would have a different agenda so it was great to see your messages come across so well. I really like your blog, and congratulations, albeit a bit late, for babywoods. Good job spreading the gospel, guys! I was in your neighborhood this weekend, but didn’t bother emailing you with all of the baby and holiday madness. But I do want Maeby and FrugalHound… er, Gracie, to meet one day! I’d only heard of you guys about four months ago, and at the time it felt like I’d found a super-secret source of inspiration. Hope the national mainstream exposure doesn’t change things for you… well, I guess it’s inevitable. Thank you! We are similarly relieved we didn’t come across as nut jobs :)! Hello Liz and Nate. It is a pleasure to finally put faces with all the stories! You two are awesome, keep up the great work. I know I’m late to the party, but was super excited to watch your Today show segment and “meet” you all. (Wish it happened after Estelle was born!) Way to get the early retirement possibility out there mainstream! And, like I said on Twitter, the rest of us early retirement seekers are there for you when the haters come: “I tried cutting back on going out to eat, but I really like it…” I liked that part at the end! 🙂 It’s not for everyone. But thanks for paving the trail! Wow! I just opened up the Frugalwoods homepage to see your bright and shining WHOLE faces in the left-hand corner, thinking, “WHOA!” Nice to meet your entire faces! I also want to add, you two are such a dashing couple! Congratulations on your great TV segment!! Hope everything is going well with Babywoods! I am a 40 something who has been a “frugalista” for years, but I turn in to your blog quite often for inspiration and to help our family stay on track with our financial goals. On a side note, we adopted a puppy earlier this year and her name is Gracie too! you guys are adorable!! loved “meeting” you! Hi there! So nice to see faces! We’ve a couple (32y) from Germany and reached FI this year. We started blogging just recently and we still blog anonimously. We’re not yet confortable with the thought of revealing our names/faces. I don’t know hot to describe it. What made you decide to step out from anonimity? Tell us about the process? We’re also organising a Financial Independence Week in Europe in Budapest (Hungary) in June 2016. Just for bloggers first (nor just european). I had you in my mind to invite as well but I guess, with a little baby, you have other priorities now. Congrats again and all the best for the baby! We always knew that we’d lose our anonymity at some point in the process and so it was really just a question of when and how. When The Today Show approached us, we decided to go for it :). I wish you all the best with your blog and with your FI Week–sounds very cool! I love Budapest, by the way, such a beautiful city :). *waves* Nice to finally meet you. 😀 Also, congrats on being on TV. I’m a bit surprised that they filmed so many months ago but are now just airing now? Was it to accommodate your pregnancy or that was the schedule they were given. I didn’t realize it took so long for something to air. Thanks! I’m not sure why it took so long to air–I think it was just their schedule for the show. So, I guess Frugalwoods we expect that we’ll be seeing your face this time in every post. Congrats! And here I was hoping Mr. FW would have a Mohawk. Still, very exciting to see the tops of your heads! Great video and good job spreading the frugality message! Wow! I couldn’t believe it when I saw your faces and learnt the name of Frugal Hound (I said to my husband “look it’s the people who own Frugal Hound”) Congratulations on the birth of Estelle and the TV slot. I’ve been a reader for a long time but this is my first comment, I love the blog and really admire your tenacity and diligence, the fact that you both truly love and enjoy your lifestyle shines through in your words and is inspirational! Yay!! I feel like I knew the secret ahead of time when I recognized Frugal Hound in a post you did in October on Buy Nothing Cambridge, (I’m also a member). I SO admire you guys and so many times while I’m reading, I’ve though, I could SO homestead and be friends with you two. I love these guys! Your writing is wonderful, too. Congrats on Estelle, she’s gorgeous! It was nice to see your faces and I really enjoyed the interview. Congrats! hi! I’m a long time reader/lurker, but I had to come out of hiding and say this makes me smile! It’s so nice to see your faces! Congrats on the tv segment and especially on your baby girl! Congratulations! I love reading your blog over the pond in the UK, and it was great to finally ‘meet’ you, both on your blog post and on the clip you linked to. Estelle is an adorable name! We love that Estelle means “star”–it was one of the reasons we chose the name :). Thank you for sharing that quote! Kia Ora, Liz, Nate, Estelle & Gracie from New Zealand ???? So glad to finally meet you guys. I have been a huge fan & been reading your blogs for quite a few months now. Love reading them very inspiring & learn a lot of things of being frugal just what we needed???? Congratulations on ur tv show & especially for having a baby girl???? You come across as so wonderful and ‘together’. I just love the way the sofa people afterwards are all saying how they couldn’t do it – that you make it look a lot easier than it is. It’s all about choices – and you are choosing such good things for yourselves. You guys are awesome. My wife and I recently moved, and after seeing how much “stuff” (i.e., junk, shackles, burdens) we had accumulated over the years, we now have a new rule, the Month Over Week Rule. Before we buy anything that will last longer than a week, we have to think about it for a month. Now we accumulate savings. Well I guess it’s never too late to leave a comment … ?! I just wanted to say I’m in love with Liz’s husky voice and Nate’s eyes – a surprise, I was expecting a higher pitched, ‘drier’ voice for Liz and Nate’s eyes are even better in ‘real life’ (on tv!) than in photos :)) I just love your blog and sigh that you now live in stunning Vermont – well done you! I’m in a beautiful part of Australia but it’s much hotter and snow is a never-feature here, let alone the gorgeous Autumn/Fall time … sigh again! Thank you guys, for being you.